Santiago, April 1: President Ram Nath Kovind paid floral tributes to Mahatma Gandhi at his statue at Plaza de la India in Chilean capital Santiago to commemorate his 150th birth anniversary and announced an assistance of USD 53,000 for the beautification of the area. Earlier, the president, who arrived here on Sunday after visiting Bolivia and Croatia, addressed the Indian community and said it has integrated well into the Chilean society and established a good reputation for itself and for India. 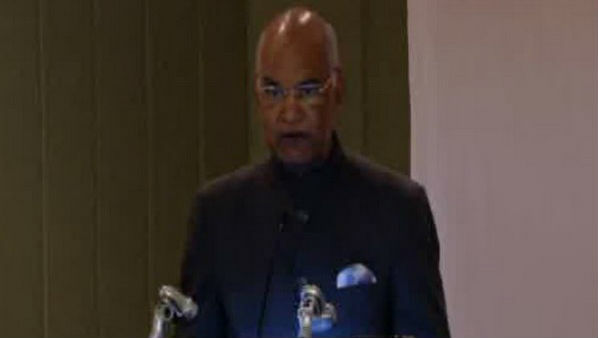 President Kovind Addresses Indian Community in Chile. "I congratulate you, therefore, on being successful envoys for India and for imbibing the spirit of "Vasudhaiva Kutumbakam” - that is- the world is one family- to the core," Kovind said. Inviting Indian diaspora to be a partner in the India growth story, he said, "We tremendously value your involvement in initiatives organised by our Government through our embassies. Such interaction defines the partnership between all of you and all of us back home, a partnership that not only is of mutual benefit, but is also a crucial building block on our route to the future." He said in India's quest for development and progress, the overseas Indian community is an invaluable partner. "We appreciate your contribution and cherish your success, and achievements," he said. He said a number of activities and initiatives such as the Pravasi Bharatiya Divas, Regional Pravasi Bharatiya Divas, Youth Pravasi Bharatiya Divas and Bharat Ko Jaaniye Quiz have been implemented for facilitating engagement with the Indian diaspora. "We have also established the Pravasi Bharatiya Kendra in Delhi, as a one-stop resource centre for our diaspora," he said. President Kovind paid floral tributes to Mahatma Gandhi at his statue at Plaza de la India in Chilean capital Santiago to commemorate his 150th birth anniversary. Mayor of Providencia Evelyn Matthei was present on the occasion and India offered USD 53000 for beautification of Plaza de la India with tree plantations. President Kovind Visits Pablo Neruda Museum in Chile. The president also visited Pablo Neruda Museum in Santiago on Sunday to appreciate literary and art collections of Chilean Nobel laureate and poet Pablo Neruda. He gifted a fountain pen to the museum in recognition of Neruda's fondness for fountain pen. He said India and Chile have identified focus areas of mutual interest ranging from outer space to health and are keen to strengthen business engagement - from IT, solar energy to mining and beyond.